Winners » April 2008 Casino Wins » April 26, 2008. Player From Finland Wins Over $5.5 Million Jackpot At Blackjack Ballroom Online Casino. This weel a long awaited Mega Moolah jackpot has been hit by a Finnish player. Blackjack Ballroom online casino has made a VERY lucky player an incredible $5,556,753.68 richer. Klaus E., from Finland became an instant millionaire last Friday when he placed a $0.50 bet on the Mega-Moolah Progressive Slot Machine at Blackjack Ballroom and walked away $5.5 million dollars richer. The winner couldn't believe that he had won a life-changing, multi-million dollar jackpot and says he was stunned and shocked and "my hands were shaking!" Now he hopes to pay off his apartment and go on a vacation as the first of many things he can do with his gigantic online casino win. A CasinoRewards group representative has said, "Klaus has just become part of an elite community of online casino players who have 'hit it big' and joined the exclusive CasinoRewards Millionaires' Club. We congratulate him on his win and look forward to joining him in his celebrations." Blackjack Ballroom casino is a proud partner of the long established CasinoRewards group, who has been in operation since 2000 and has a total of 18 popular online casinos and 5 poker rooms under its loyalty program. Casino Rewards is part of the Microgaming community and this progressive jackpot win has been the biggest for both established groups. In fact it's the second largest online jackpot in the history of Internet gambling; the first biggest jackpot of over $8M has been hit on Millionaires Club slot machine at InterCasino in May 2007. Klaus has become the 4th Member of the CasinoRewards Millionaires' club, and brought the total progressives jackpot wins across the CasinoRewards casinos to over $27 Million Dollars! Roger Raatgever, CEO, Microgaming, says, "Those that say thirteen is an unlucky number have only to take one look at Klaus E. who not only becomes the Microgaming Progressive Jackpot's thirteenth millionaire, but by far and away the biggest jackpot winner we've ever had. Mega-Moolah has been tantalising players for months now and its finally delivered on a massive scale - with $5,556,753.68 being one of the largest payouts this industry has ever seen." Arrangements are currently being made to fly Klaus to Sydney, Australia where he will be presented with a check of his huge winnings and celebrate what is the biggest win in Blackjack Ballroom casino's history. His win proves that when luck strikes, it hits hard and you don't have to play big to win big! With more than just online blackjack, Blackjack Ballroom features over 250 games including progressive jackpot games, tables, slots and card games catering for every player. New players can start playing with €/$500 FREE as the casino is giving away €/$500 and 1 hour of real casino play to win as much as you can and keep winnings. 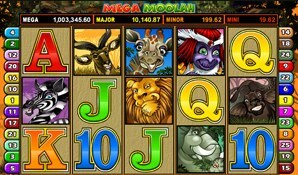 Mega Moolah is a 5 reel, 25 payline, and 125 coin slot machine game with progressive jackpot. The slot has a wild (Lion), multiplier symbol, a scatter symbol, a Free Spins bonus game and a randomly activated Mega Moolah Progressive Jackpot bonus game where you can win one of four guaranteed progressive jackpots. Tags: Mega Moolah, Largest Jackpot, Finland, Blackjack Ballroom, Million.